Paul over at Hee Haw Marketing thought I should re-post my living manifesto. And Paul is a pretty bright guy—so I'm taking his advice. One distinction about this version—I'm including this photo with it which was taken in Central Park on a beautiful Autumn day just like today. 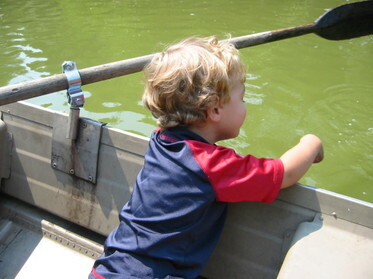 I think I'm drawn to this image because on that day we took a rowboat ride in Central Park and it was delightful. But the sad thing about it was that in all my years of living in NY, I never took advantage of doing something like this. So this photo is inspirational to me because it serves as a simple reminder to always make the most of where you are at—while you can. Ask questions. Lots of them. Ask the silly ones. The ones that no one else wants to ask. Ask about the bigger idea. Ask about the details. Ask why—but also ask yourself why you are asking the questions. Do you believe in what you do? Would you rather be doing something else? Believe in what you do. Or find a new career. Everybody needs a hero. We just don’t want to admit it. Find someone who needs a hero. Not your boss—but the person looking for guidance—a word of encouragement or inspiration. Be that hero even if your own heroes don’t exist for you. Talk is cheap as the cliché goes—what have you produced lately? Make it a point to end your week with at least one tangible piece of something that can be saved, printed, shared, or produced. If you can’t do it in your job—do something on your own. There are two types of people. Those that dream of change and those that make change happen. But we all start out as dreamers—the difference in going from Dreamer to Agent includes taking ACTION. Build bridges. Get out of your discipline. Infect others with ideas. Don’t be satisfied with “OK”. Change Agents are not Rogue Agents—if you are really interested in change, you’ll do whatever it takes to make it happen. Play In Someone Else’s Sandbox. Traditional people don’t like it when you get up all in their space. They'll become possessive, protective and territorial. All the more reason to get in their sandbox. Invite them to play—even if they don’t want to. One day, they may change their mind.